FEATURES Made of high temperature resistant nylon yarn, it is soft and does not hurt the pot. 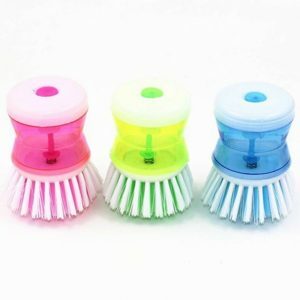 Press-type design, easy to use, strong cleaning effect, not dirty hands. The product is easy to disassemble and can clean the inner wall. 1. Used to brush the bowl. 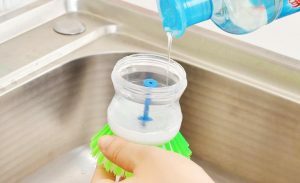 Use a sponge brush to apply a little detergent to the bowl. You don’t need to touch the oil directly with your hands. The sponge has strong water absorption. It is easy to drain after washing. You don’t have to use the detergent to wash it again. It is simply a good helper for dishwashing. 2. Clean the fan. 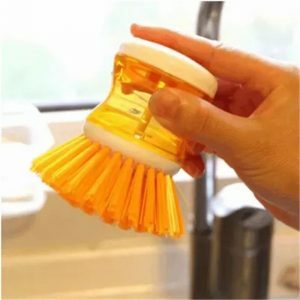 Use a knife to shape the sponge brush into a single shape. 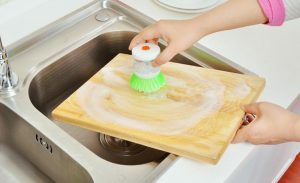 The sponge brush is cleaned with water and detergent on the surface of the fan cover, and the dust inside the gap can be easily removed. 3. Clean the water pipe. The water pipe is clogged, we only need to take the green part of the sponge brush off with a knife, and then fold this part into a size that can just be stuffed into the water pipe. After plugging, we will connect one end of the water pipe to the faucet to release the water. This part of the sponge brush will absorb the water, and then discharge the dirt together with the water flow.